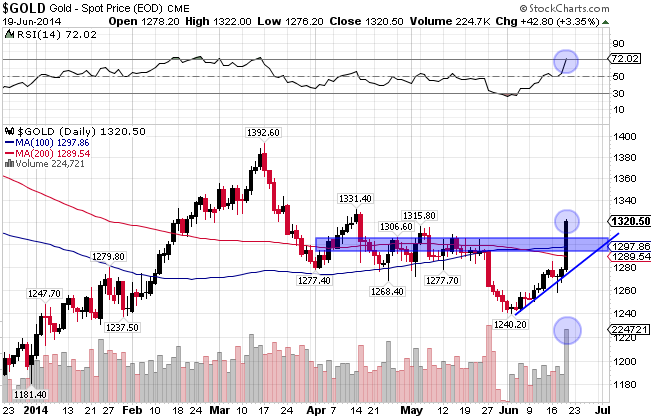 Gold and silver both climbed above key resistance levels today at $1,290 and $20, respectively. Gold shot up $40 or 3.2% and silver was up $0.96 or 4.8% today alone. Most of the stocks in the GSB model portfolio were up 6% or more, while our latest portfolio addition rocketed 15% higher today! The technical chart for gold shows the importance of today’s surge through key resistance and through both the 100-day and 200-day moving averages. This occurred with strong volume, which helps to reinforce our bullish outlook. The RSI hit overbought levels on today’s break out, but I expect only a mild pullback before the uptrend resumes. The chart for silver is even more dramatic, with the price blasting through key levels of resistance and both moving averages. Volume was strong and I expect that previous resistance at $20 may now turn into support. Those are impressive numbers for a single day, but this uptrend has been in the works for a few weeks. Since the start of June, gold is up $75 or 6% and silver is up over $2 or 11%. June is typically the worst month for precious metals when looking at seasonal charts, but not this year. Many of the mining stocks that we track are up 30% or more in the past 3 weeks. Looking forward, prices start to gain momentum after June and close the year very strongly. While a pullback tomorrow would not be surprising, I believe the trend will be towards higher prices for the remainder of the year. 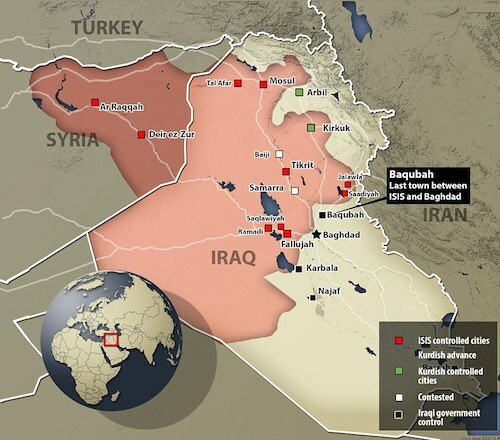 Part of the recent gains can be attributed to increasing instability in Iraq, as the Sunni Jihadist group ISIS has taken over much of Western and Northern Iraq, plus a large portion of Eastern Syria. They have been on a brutal rampage slaughtering civilians indiscriminately and have looted the central bank in Mosul of $450 million, making them the most wealthy terrorist organization in the world. As of today, they are now reported to be in charge of the largest oil refinery in Iraq. But, the advance in precious metals started well before this new insurgency took hold. Inflation is finally starting to pick up, as the May consumer price index (CPI) rose 0.4%, 2.1% year-over-year, well above the consensus estimate. Furthermore, the Federal Reserve made bullish comments for gold today, saying they are committed to accommodative measures and low interest rates well into the future. These comments drove the dollar down and boosted demand for precious metals. With China, Russia, India, Brazil and countries around the world abandoning the dollar in international trade, dollar weakness is likely here to stay. The United States has benefited immensely by controlling the world reserve currency at the expense of other nations. We exported our inflation and were able to live well beyond our means. But these days are numbered and the end of the dollar’s rein in rapidly approaching. Adding fuel to the fire, many technical traders and gold shorts were forced to cover positions this week on the advance in precious metals. These large and leveraged paper positions tend to exacerbate the price movements in both directions. If we are indeed finally witnessing the end of the 2-year correction in precious metals, the upside potential is absolutely staggering. The past two advances more than doubled in their magnitude, as did the past two declines. If the is trend holds true this time around, we are looking at an advance of at least $2,400 from the cycle low of $1,200, which gives us the minimum price target of $3,600 for gold! These cycles last 24 to 36 months, so we can expect this price target at some point around the start of 2017. 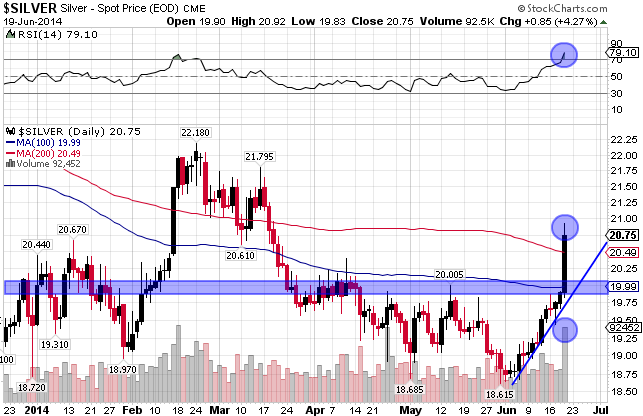 Applying this analysis for silver forecasts a minimum price target of $100 in the same time frame. 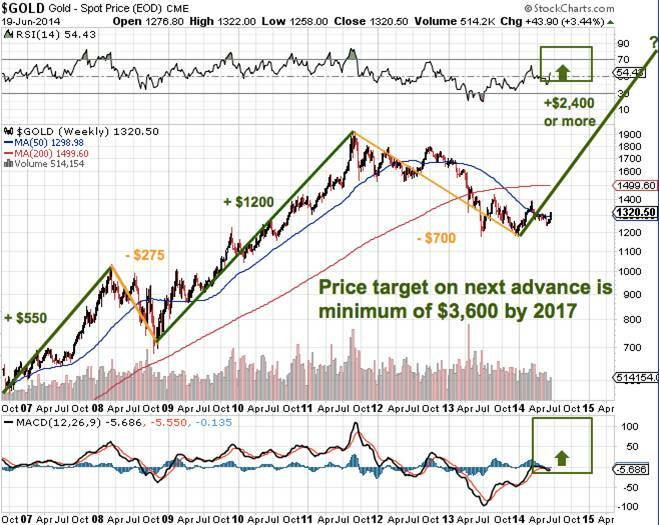 If this price target comes to fruition, anyone picking up precious metals at current prices is going to become very wealthy. And while we advocate holding physical bullion in your possession, we expect quality mining stocks to offer leverage of 2X to 4X the advance in the underlying metal. So, if gold triples over the next few years from $1,200 to $3,600, a solid mining company should see their share price go up 6 to 12 times! And if you are able to pick successful junior mining stocks before the market piles onboard, the gains will be orders of magnitude higher. As bullish as I am on precious metals going forward, it is important to realize that manipulation is still occurring and there are banks with access to nearly unlimited funds and extreme leverage via futures markets that can slam the price down at will. They are finally being exposed and even fined for the manipulation, putting an end the cries of “conspiracy theory.” But I am not convinced that they are out of the market quite yet. So, I think it is wise to scale into positions slowly at this juncture and keep some cash on the sidelines. Going forward, I believe that the all-in cost of production for gold and silver will continue to act as support on any take down attempt. And the downside risk of such a drop is minuscule compared to the upside potential detailed above.